In 1984, Healthy Charlotte Alliance established the James Gray Cannon Award. We present this award to an individual who has demonstrated exceptional leadership, on a voluntary basis, toward the advancement of medical care and good health in the Charlotte-Mecklenburg community. Past recipients include hospital volunteers, organization founders and board members – people who, through their unselfish dedication to an organization or cause, have made a difference in our community. Recipients of the Cannon Award receive an engraved plaque and are allocated $1,000 to donate to the charity of their choice. The winner will also be honored at our Annual Meeting, May 15, 2019. The nomination window is now open for the 2019 Cannon Award and we will accept nominations until February 28, 2019. We invite you to nominate anyone who meets the criteria outlined by submitting an online nomination form. Nominees will remain on active file for consideration for three years. Volunteers, as well as health care professionals volunteering outside their paid positions, are eligible. 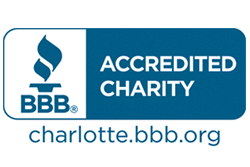 Members of Healthy Charlotte Alliance are not eligible. We look forward to receiving your nomination for this humanitarian award. If further information is needed, please feel free to contact Cannon Award Chairperson, Mimi Compton. "Recognizing there are hundreds of active volunteers in the Mecklenburg area, I feel awed and honored to have been singled out to receive MMAE's Cannon Award in 2014. My long involvement with Juvenile Diabetes Research Foundation (JDRF) has been personally valuable and exciting. Receiving the Cannon Award for my work with JDRF has added a third dimension of value to the way I feel about those years. My heartfelt appreciation to the members of MMAE. Until the "end of my days", I promise I will continue live up to your honor." 2018 Suzy Garvey has served multiple terms on the board of Hospitality House of Charlotte for the past 21 years. She has chaired and still serves on the Advisory Committee, Strategic Planning and Development Committee. Thank you Suzy for your service to the community. 2017 Meghan Hampton founder of “In the NIC of Time” which supports the Neonatal Intensive Care Nursery at Levine. Meghan is a fierce advocate for the smallest fighters in our community. 2016 Laura Funderburg for her work with Arts for Life, both in helping to launch the program at Levine Children’s Cancer Center and for her dedication, compassion and dependability as a volunteer. 2002 Quay Youngblood-Volunteer at Presbyterian Hospital for over 24 years. 2001 Barbara Hautau-Afflicted with MS since the late 70’s, formed a Christian based MS support group in 1993 and, with her husband, organized an annual banquet at Calvary Church for people with disabilities. 2000 Rex Welton-A prime force in the establishment of the Buddy Kemp Caring House which offers unique support for cancer patients, involved with the Mercy Hospital Foundation, Leukemia Society of America, the YMCA, Dalton Village, the Duke University Cancer Center, and the Presbyterian Hospital Foundation. 1999 Bruce Parker-Community philanthropist with a long-standing interest in hunger relief as well as support for housing and other health-related activities. 1994 Thereasea Elder- founder, Cleo Young Scholarship Award in Nursing (Queens College), Drafting team for 50% by 2000 program to reduce teen pregnancy, organizer of health fairs and educational programs for women and pregnant adolescents. 1992 Dr. Linda A Berne-Founder and President, Mecklenburg Council on Adolescent Pregnancy, March of Dimes, NC Coalition on Adolescent Pregnancy.